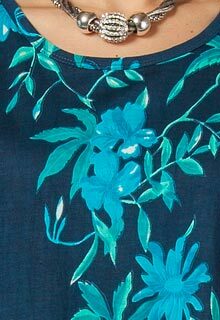 La Cera brings you this nicely styled A-line plus womens cotton dress with a lovely flowered pattern on a deep navy backdrop. This dress is a stylish grab-and-go for a house dress or for outdoor festivities in warm weather. Care Instructions: Machine wash cold with like colors only, gentle cycle, do not bleach, hang to dry, steam or warm iron as needed. Made in India for La Cera. 2523XL-16236.